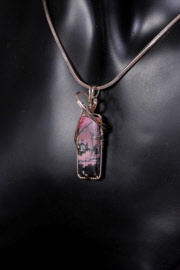 This natural rhodonite gemstone originates in Australia, cut into a rectangular shape cabochon, measures 17 mm x 10 mm. Colors in this stone remind me of a scene at sunset. Wrapped in sterling silver wire in a prong setting. Finished size 45 mm x 17 mm. Weight 0.3 oz. 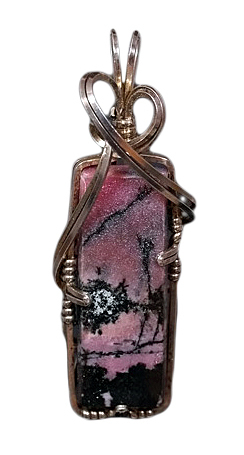 Rhodonite, believed to be a calming stone, it soothes and brings order to feelings that are scattered, imbalanced or ungrounded.